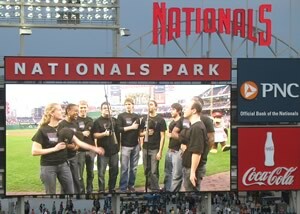 The original cast sings the national anthem during opening week at the Washington National’s Ballpark. Looking for Roberto Clemente was commissioned by Imagination Stage, Bethesda, MD, and premiered there in 2008 under the direction of Kate Bryer. 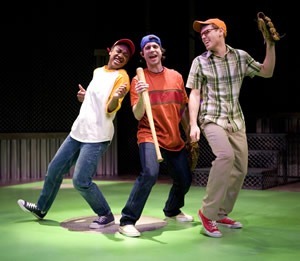 It received the DC Theatre Scene Award for Best Family Show of the Year. Looking for Roberto Clemente is published by the Dramatic Publishing Company. Imagination Stage Original Cast. Erika Rose, Derek Manson and Zack Colonna. Photo Credit: Scott Suchman. Audio demo features the voice talents of Ryan Amador (Sam), Danny Bolero (Clemente), John Krause (Joe), Jimmy Lambert (Peter) and Angela Wildflower (Charlie). Music: 70’s-flavored Rock score for Piano, Keyboard, Bass, Drums, and optional Guitar. Accompaniment tracks available. 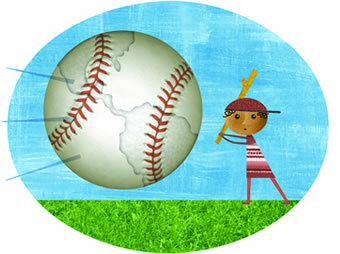 To hear a full demo of Looking for Roberto Clemente contact us directly via our contact page.